Your car is full of electronic devices. In fact, General Motors is one of the largest computer manufacturers due to its need of microcomputers in cars that it makes. 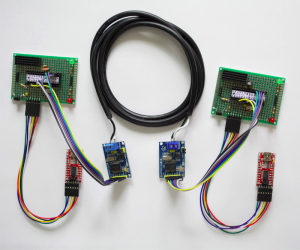 If you have an interest in what goes on with your cars’ electronics, you might want to invest some time hacking your car with an Arduino and a CAN BUS Module. A modern car has many ECUs (or Electronic Control Units). These ‘computers’ send and receive information over the cars’ CAN BUS. De-coding that information can give you a wealth of information about the workings of your car. The CAN BUS on your vehicle can be accessed from the OBD II connector. I wrote about OBD II and diagnosing car problems in an earlier post here. If you are wondering if your car has an OBD II port, it probably does. All cars and light trucks built and sold in the United States after January 1, 1996 were required to be OBD II equipped. Note: Pins 6 and 14 are specifically for the CAN BUS. The module has a seven pin connector for attachment to the Arduino . Two pins are used for +5V (power) and GND. The other five (MISO, MOSI, CS, SCK, INT) are for the SPI interface.. The J1 connector is a jumper for 120Ohm termination of the bus. (I have that jumper connected on both modules in my test environment shown below.) The CAN BUS is connected to the module either by the screw terminals or the two pin header behind the screw terminals. Note that one is labeled H for High and the other is L for Low. Basically, a double wire connects the CAN BUS High/Low connections on the module which is wired (SPI interface) to the Arduino. Each DIY Arduino has an FTDI USB to Serial connection to the Laptop/Phone/Computer. This setup allows you to make sure the modules are working properly and gain understanding of how the CAN BUS works. 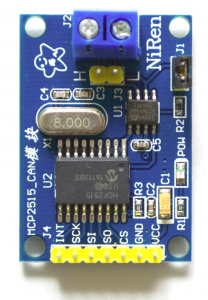 There are several libraries for the Arduino to interface with the CAN BUS modules. I used the one from here. When you attach your module to the CAN BUS you will need to know its speed and set that value accordingly in the sketch. Also the crystal speed that your module uses (mine is 8Mhz) needs to be specified. Make sure the library you choose (if you don’t use the one I linked to) supports your crystal speed. For my two module CAN BUS test network, I loaded the send example sketch into one Arduino and the receive example sketch into the other arduino. I set the crystal speed to 8Mhz (MCP_8MHZ) and the rate to 500Kbps (CAN_500KBPS) in each sketch. The send sketch sends a message every 100ms which the receive sketch then prints to the serial console. Once you get the modules working, you are ready to attach one of the modules to your cars’ CAN BUS. The only possible change that will need to be made on the Arduino receive sketch is the CAN BUS rate. It needs to match the CAN BUS rate for your specific car. A bit of googling will hopefully get you more information on that. I have speedometer hybrid, already installed in the car. You will probably need to do more research into the specific devices you are interested in hooking up. That is always a challenge. Did you try searching to see if anyone else has interfaced your specific hardware to an arduino or other microcontroller system?